Great Yamaha outboard news to my 'nautical' ears! Marine Speakers with built-in LED's. Aquatic AV Pro-Series 6.5” speakers have been designed, engineered and built to provide superior sound quality under the most demanding conditions, like boats on the water. Rated at 100W max power output (50W RMS) and frequency response of 52Hz-20,000Hz, Aquatic says these 6.5” cone marine speakers are capable of delivering great audio quality with all music types, from a quiet session of classical music to pumping out dance tracks at high volume. Available in white (show here), black and chrome with --- my favorite feature --- built-in blue LED illumination. The Pro-Series speakers feature a removable, classic style grill, fully waterproof design, UV and salt/fog protection. They're supplied with stainless steel mounting hardware and will mount directly into an aperture of 130mm and requires a depth of 70mm. MSRP US $149.00. This press release crossed my desk on 28 September 2016. The AM37 is the result of two years of research and development, challenging the status quo of the nautical world and combining the best in innovative technology and bespoke craftsmanship. The AM37 was a true team effort, bringing in the most experienced Aston Martin designers to style and create a truly unique product. Aston Martin’s master craftsmen who worked on cars such as One-77, Aston Martin Vulcan and the new DB11, provided their automotive experience, which was reinterpreted onto the boat with outstanding results. Aston Martin’s EVP & Chief Creative Officer, Marek Reichman commented: "AM37 is a pure translation of the Aston Martin DNA into an entirely new maritime concept. The powerboat reflects our values in terms of power, beauty and soul. The AM37 is a day cruiser that can be transformed into an overnight berth by transforming the table into a comfortable bed. The cabin is well appointed with mood lighting and air-conditioning. With a refrigerator, microwave oven and coffee machine - and a lavatory on board, absolute comfort is guaranteed. Crafted from the finest leathers, elegantly laid out rear seating is available for up to eight people. The 37-foot model is available in two versions - the AM37 with an estimated top speed of 45 knots and a choice of two 370 hp Mercury diesel or two 430 hp Mercury petrol engines. And the AM37S version with an estimated 50 knots derived from its twin 520 hp Mercury petrol engines. 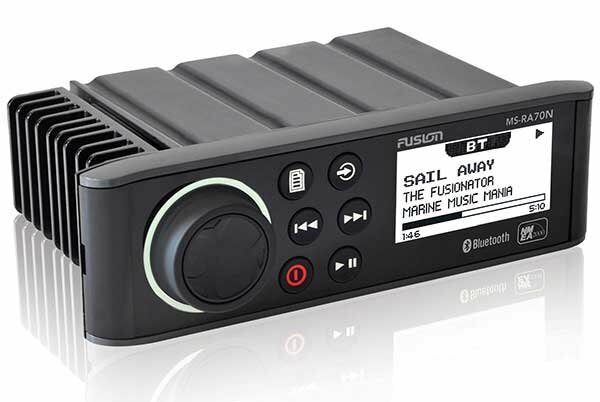 Can your rugged boombox audio system start your boat engine or car engine? This was the first time I learned about DreamWave products, so all the info here is from the spokesperson, the company website and Amazon. The reviews on Amazon about sound quality are very good. -- If your boombox can't start your car, this one can! The Survivor is the world's first and only all-in-one high performance 30W Bluetooth speaker sound system and 400A emergency 12V car battery jump starter. Party with friends and family all day long with its built-in 12,000mAh lithium polymer battery. When it's time to pack it up and your boat or truck won't start, hook up the Survivor to its battery and jump start it right up. The emergency car battery jump starter is powerful enough to start up a 7.0L V8 engine. It also has an ultra-bright 110 lumens LED flashlight with SOS flash sequence. Rugged construction, IPX5 protection against water/dust/sand/snow. MSRP: $280.00. Lots of marine audio options in a small space!